Tux Paint is a drawing program for young children. 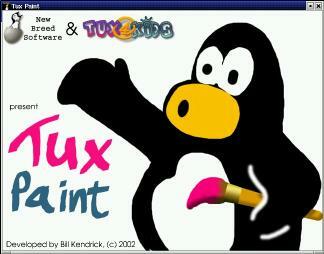 Tux Paint" is a drawing program for young children. It has a simple interface and fixed canvas size, and provides access to previous images using a thumbnail browser (it provides no access to the underlying filesystem). Unlike popular drawing programs such as "The GIMP," it has a very limited toolset. However, it provides a much simpler interface, and has entertaining, child-oriented additions such as sound effects. Easy and Fun Tux Paint is meant to be a simple drawing program for young children. It is not meant as a general-purpose drawing tool. It is meant to be fun and easy to use. Sound effects and a cartoon character help let the user know what's going on, and keeps them entertained. There are also extra-large cartoon-style mouse pointer shapes. Extensibility Tux Paint is extensible. Brushes and "rubber stamp" shapes can be dropped in and pulled out. For example, a teacher can drop in a collection of animal shapes and ask their students to draw an ecosystem. Each shape can have a sound which is played, and textual facts which are displayed, when the child selects the shape. Portability Tux Paint is portable among various computer platforms: Windows, Macintosh, Linux, etc. The interface looks the same among them all. Tux Paint runs suitably well on older systems (like a Pentium 133), and can be built to run better on slow systems. Simplicity There is no direct access to the computer's underlying intricacies. The current image is kept when the program quits, and reappears when it is restarted. Saving images requires no need to create filenames or use the keyboard. Opening an image is done by selecting it from a collection of thumbnails. Access to other files on the computer is restricted. openSUSE comes with many stamp packages for tuxpaint. Normally they should be installed automatically when selecting tuxpaint. You can find the corresponding RPMs searching for "tuxpaint-stamps-<name>" where <name> is the name of the stamp theme. The additional package tuxpaint-config contains a control GUI for parents and teachers. The software can be found in the "System" -> "Tools" menu. - A really good overview about all aspects of tuxpaint. - Configuration options available for Tux Paint. This page was last modified on 27 July 2010, at 09:42.